This savory focaccia bread is made with Odyssey® brand Greek yogurt and Feta. The perfect compliment to any dish or appetizer. This savory focaccia bread is made with Odyssey® brand Greek yogurt and Feta. Coat a light-colored heavy non-stick rimmed sheet pan with cooking spray; set aside. To prevent bread bottom from over browning, set the oil coated sheet pan inside an uncoated second pan. Baking with stacked pans gives needed insulation. In a large bowl of a stand mixer, add flour, yeast, rosemary, sugar and salt, whisk to combine. Fit mixer with a dough hook. Microwave water and oil in a microwave safe glass measuring cup on high for about 40 to 45 seconds (temperature should be 120oF to 130oF). Gradually pour mixture into dry ingredients while beating. Beat on medium speed until well combined. Add Greek Plain Yogurt, Feta Cheese and tomatoes, beat on medium speed until combined. Knead for about 8-10 minutes. Dough should come together to form a ball shape, but will still be slightly sticky. Coat a large mixing bowl with cooking spray and place dough ball in the bowl; coat plastic wrap with cooking spray and cover bowl. Let rise in a warm place until dough doubles in size, about 1-1½ hours. After dough has risen, carefully transfer dough onto the prepared sheet pan and hand pull until focaccia almost fills pan. Coat plastic wrap with cooking spray and lightly cover focaccia, let rise in a warm place for about 1 hour. Place oven rack in center of oven and preheat oven to 400⁰F. After second rise, poke surface of dough with the handle of a wooden spoon for the desired dimpled look. 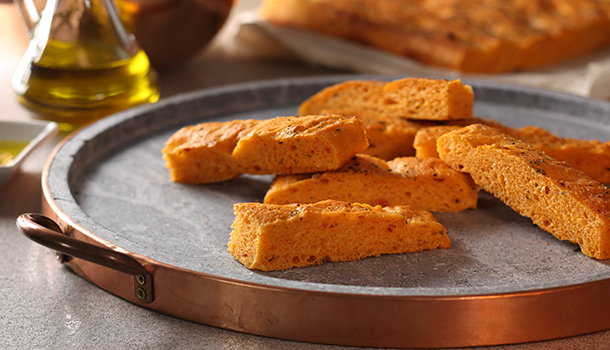 In a small bowl, combine oil and rosemary and brush over focaccia. Evenly season with coarse salt. Bake focaccia until done, about 20-25 minutes. Cool on a wire rack.